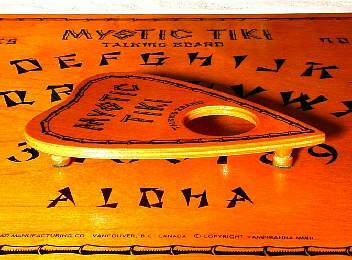 The MYSTIC TIKI is the world's first-ever Hawaiian Tiki-god inspired ouija board! Let the MYSTIC TIKI guide you into unexplored and magical worlds. Tiki images are felt to be imbued with the super-human powers of protection, happiness, and strength of the gods they represent. 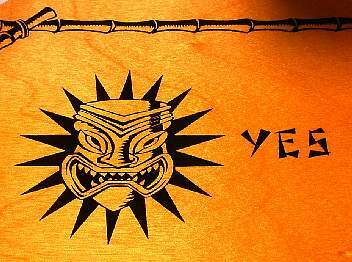 The south-pacific peoples' faith in a "greater mind" or "universal power" is embodied within their representations of man-gods in the various forms of the Tiki. 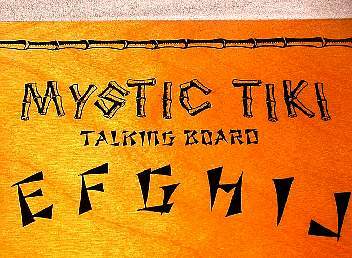 Captured within the MYSTIC TIKI Talking Board is that same powerful Tiki essence. 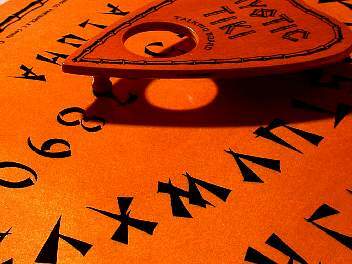 The Mystic Tiki is arguably one of the finest traditional-style Ouija boards ever made. The Museum of Talking Boards has said "it's the nicest wood board we have ever seen, and we've seen quite a few". 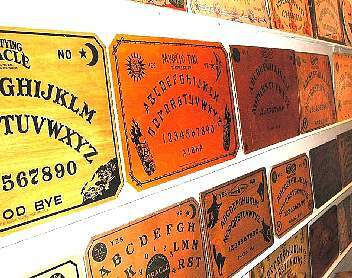 It was created by artist Vampirahna, in cooperation with The Zenrad Manufacting Company, to resurrect the form and spirit of talking boards from the ouija heyday of the early 20th century. 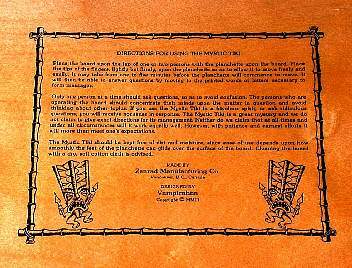 Unlike the lithographed paper or computer-generated boards commonly available today, this board should endure and still be highly sought-after into the next century. 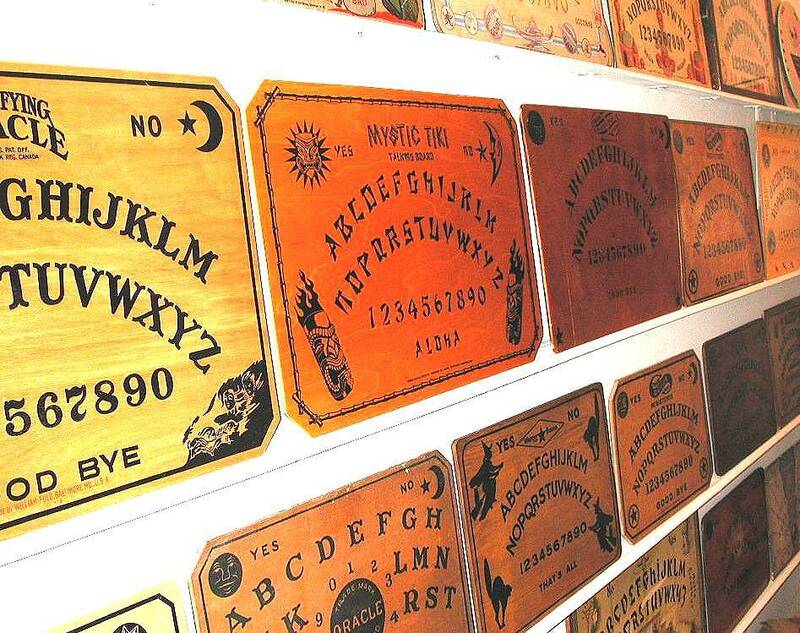 Vampirahna gained inspiration from one of the world's largest private talking board collections by studying every significant board in history and adopting their best features for the creation of the MYSTIC TIKI. 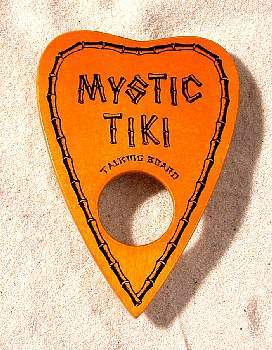 The MYSTIC TIKI is produced by hand in small quantities by skilled craftsmen. 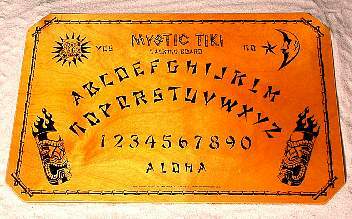 The MYSTIC TIKI is one of the only talking boards in the world still being made using methods close to those used by William Fuld. Great care and attention has been given to every detail of this full-sized (15" x 22" x 1/4") talking board. 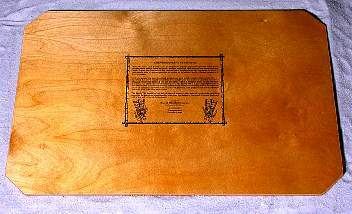 The time, effort, skill, and material costs of this board are without doubt greater than any other current or antique talking board. The warm, irridescent glow is the result of a labour-intensive, multi-layer, hand-rubbed lacquer finish that sets off the natural beauty of the fine birch veneers. Please note that this board is NOT simply a design printed by a computer and stuck onto a piece of wood. The graphics on this board are printed directly onto the board's surface and protected by a top coat of lacquer. 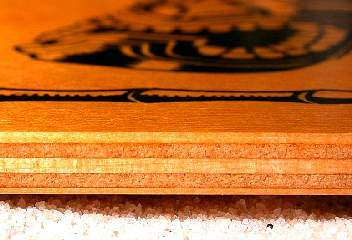 What you see is the wood's natural grain, the ink, and the finish. There are NO decals of any kind upon the board. 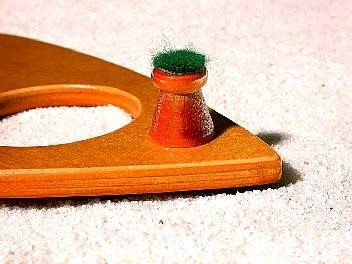 The planchette has been crafted to the same high standard and is a perfect complement to the board. With its own graphics and custom-turned wooden feet, it is a work of art in itself with a look and feel not seen for over 60 years. Soft felt pads on the feet, combined with the board's wonderfully smooth finish, allow the planchette to effortlessly float across the board with "ghost-like" fluidness. Even the back side of the Mystic Tiki has been designed and finished as carefully as the front. Note again that the image on the back is NOT a decal but is printed directly on the board. 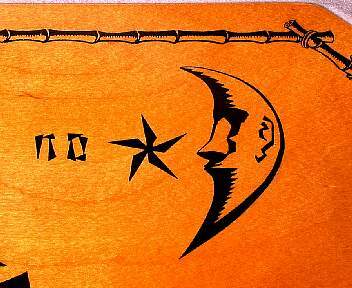 The MYSTIC TIKI layout follows the classic ouija tradition, but presents it in a novel and refreshing way. 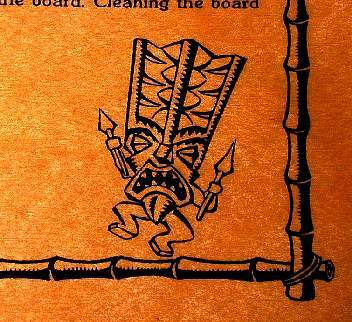 For example, the upper left tiki sun is modeled after the tiki god Ku. In island lore, the tiki god Ku was the most aggressive of all tikis and is associated with war. Ku represents the East, or the sun rising, which indicates morning. Throughout ancient times, Ku was the most feared Tiki because of his fiery temper and destructive personality. On the upper right is an Easter Island Moai Head inspired Tiki Moon. The Moai statues found on Easter Island were thought to be symbols of authority and power, both religious and political. They were not only symbols, but to the people who erected and used them, they were actual repositories of sacred spirit. Carved stone and wooden objects in ancient Polynesian religions, when properly fashioned and ritually prepared, were believed to be charged by a magical spiritual essence called mana. The ahu platforms of Easter Island were the sanctuaries of the people of Rapa Nui, and the moai statues were the ritually charged sacred objects of those sanctuaries. 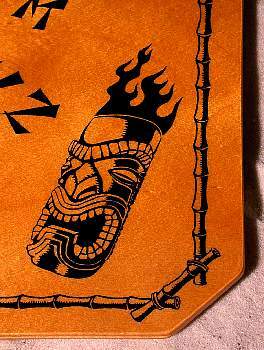 On the bottom left and right corners are two flaming Lono-derived Tiki gods. Lono is considered the god of good-luck and protection. He sets examples, builds character, and is a seeker of spiritual knowledge. He gains strength through the generations and is considered to be the most ancient and therefore wisest tiki god. 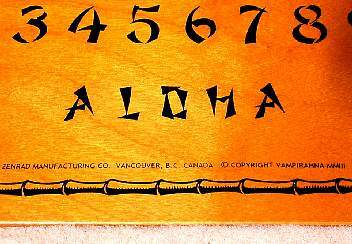 Achieving something of a landmark in traditional ouija board design, Vampirahna has added a unique twist by creating back-side artwork specifically for the Mystic Tiki rather than a "generic" block of unadorned instructional text as was common to the designs of Fuld and his contemporaries. Featuring prominently are are two fierce-looking, dancing Kane Tikis. Kane was perhaps the most important of the great gods named by the Hawaiians. A god of procreation, he is worshipped as an ancestor of chiefs and commoners alike. According to one version of the Kumuhonua (the first man) legend, he formed the three worlds - the upper heaven of the gods, the lower heaven above the earth, and the earth itself as a garden for mankind - also furnishing the latter with sea creatures, plants, and animals. Despite his appearance, no human sacrifice or laborious ritual is needed in the worship of the benevolent Kane. Let the spirits of The MYSTIC TIKI be your guide!